Firstly, this bus ride was advertised as featuring breakfast (much to my delight) and a light lunch. Breakfast consisted of a chocolate biscuit and Nescafe. Lunch consisted of several kinds of biscuits and a cheese sandwich (vegetarian option- ham in the non-vego one...i'm assuming the coeliac version was just a piece of cheese and a piece of ham). In between these two fantastic meals we had the bus ride which took us from Argentina back into Chile. This was probably the windiest road i've ever been on in my life. Marcello spent the 4 hour trip exclaiming how fantastic the road would be to drive while i kept my eyes closed and tried not the let motion get to my stomach. In addition to the winding road, it also went to a reasonably high altitude as it crossed over the Andes (this time through desert instead of snow) to cross back into Chile. Our destination, San Pedro de Atamcama is at an altitude of 2600m (I think) above sea level. 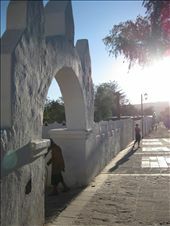 Sn Pedro is a beautiful little place that serves as a base for tours around the desert areas and salt flats etc of Northern Chile and Southern Bolivia. 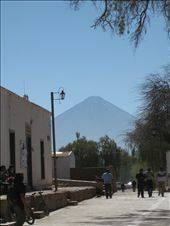 The town features little more than a cute church, dirt roads, loads of tour agenicies and a volcano looming in the background. The reason we chose to go to back into Chile was so that we could cross the Bolivan border via a tour that would take us to the Uyuni salt flats in the south of Bolivia. This is a 3 day, 2 night 4WD tour that is quite popular but also plagued with problems (as a reult of shady tour operators, drivers who drink and generally getting ripped off). In addition to the dangers of the drivers etc you also face the very real possibility of getting altitude sickness (if you haven't already) as you ascend to 4850m on the very first day. Altitude sickness can kill you and so you really do have to be cautious. Picking a tour operator is somewhat difficult because you really have no idea who you can go with. You're meant to check the car you're going in for seat belts and first aid kit. Also when you go to the tour office they should have a full itinerary and explain everything to you thoroughly. There are online reviews of tour operators and for every good review there is a bad one and vice versa. Our Lonely Planet advised us to go to the information office and read the book of complaints to see what other peoples' experiences were like before picking an operator. Diligently we follwed this advise and decided on an operator. I think this is when our first true Latin Adventure began. 1. We had to start taking our medication to aid with altitude sickness called Diamox. 2. Somewhat like self diagnosing yourself via the internet when you have a cold I began reading about side efffects of Diamox and scared myself shitless. I read that tingling is normal but tingling in your arms and legs is serious and requires urgent medical attention. Also things to do with change in vision etc require urgent medical attention. Needless to say I had a panic attack when I felt a bit whoozy and Marcello told me off for reading all the stuff on the net. 3. The following day we left for the tour (bus to the Bolivian border followed by 4WD for the next few days) only to find out there was now 8 people booked. Because you got a bus first there was no opprtunity to inspect the car prior to departure. 5. We talk with the other 4 people in our new tour and turns out they didn't really put much thought into who they chose as a tour operator. Day 1: White lake (filled with Borax), green lake (coloured by arsenic, lead, copper and other heavy metals), thermal springs (amazing hot springs in the middle of the desert- 4400m), geysers (pools of sulfuric acid which have large amounts of steam spewing from them, quite surreal- 4850m) and red lake (coloured by microrganisms and FILLED with flamingos). Stayed the night next to the red lake which was at 4278m and so we all felt a bit average from the altitude). Also we think it got down to -10 degrees over night (well we think that's what our guide was saying) so it was mightly cold. Day 3: Up at 4:30am for breakfast at 5am to leave by 5:30am to see the sunrise over the salt flats. Amazing sunrise, playing around with photos on the salt flats were you can do silly photos because of the lack of distinguishing features on the landscape nallow you to play with perscpective, isla de los pescadores (island in the middle of the salt flats covered with cacti and 2 bored looking llamas, salt hotel (hotel built out of stones made of salt), artesian market (standard on any tour) and into the town of Uyuni. We were meant to see the "train cemetary" where trains go to rust but I think our tour guide was sick of us by then and he ditched us at the tour office. Despite felling pretty crap due to the altitude and the Diamox (headache, nausea, digestive system either slowing down or speeding up) wwe were pretty happy with our tour. The people we met were good fun (a couple from Germany and another from Holland). Our driver was very safe and he kept an eye on all of us- only downfall was he spoke no English despite promises of an English speaking guide...but that's why you research things before going on tours so you have an idea of what you're doing ahead of time. 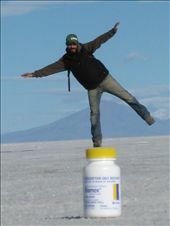 While in Uyuni we came across the people who were on the tour we were meant to do and we asked them how their trip was. Turns out their driver was a drinker. On their final day they missed the sunrise because he was drunk and slept in. Then whilst driving he fell asleep and hit a rock and woke up and one of the travellers had to drive. For this we thank our lucky stars that we were moved to the other group. We are very lucky! 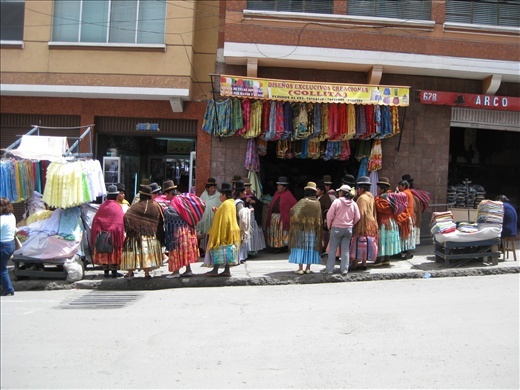 We are currently in La Paz in the north of Bolivia. Lots of people (including lots of small plump ladies wearing traditional attire), lots of markets and lots of hills. But we both quite like it here. We've been warned by other travellers about bag slashings and attempted muggings etc but thus far our only risk is being ripped off because we are "gringos" (they take one look at us and immediately increase the price...lucky it's only a matter of Australian cents so we don't mind too much). The women in traditional attire here are amazing. We've tried to covertly take some photos of them and have got a few shots for you to enjoy. They carry so much stuff in bundles wrapped in blankets slung across their backs (sometimes the bundle is a child!). They climb steep hills with their load and they wear skirts and pantyhose even when it's very chilly. Yesterday there was some sort of protest as miners (we think) protested something. We also went to the Coco Museum which chronicals the history of the Coco leaf. Quite sad actually. The coco leaf has been used by the Incas for over 4000 years, mainly to help with the altitude and as a way of connecting with Pachamama (mother earth). They usually chew the leaf. Not long ago Westerners came along and claimed that the coco leaf was evil and that it made the Incas stupid. They outlawed the chewing of it until they realised what an impact it had on the workers (particuarly those in the mines who could be made to work for 48 hours straight with no break and no food if they chewed the leaf). Because they could make the Incas work so much harder they made it legal but imposed a tax. When people create cocaine as is sniffed up the nose of people "searching for an instant satisfaction" they use things such as sulfuric acid, kerosene and acetone in the production. We also learnt that Coca Cola was developed during the time of prohibition in the US as a beverage that would provide some sort of high to substitute for the lack of alcohol available at the time. Today we ventured from the market filled section of Rosario to Sopocachi to find a supermarket in search for something in the family of Nutella (the couple from Holland who did our salt flats tour are here in La Paz with us and they have a jar of Nutella and my jealousy inspired the 30mins trip down the hill to find a supermarket so we can purchase our own jar). We have acquired a German version of Nutella which will suffice and far exceeds the jam often provided with breakfast. Our next step is to head to Copacabana on the edge of Lake Titicaca and then across to Puno which is on the Peruvian side of the lake. At this stage our stomachs are suffering a bit (not sure if it's the altitude or the food or a combination of the two) but as long as we ensure we are near a baño of some form (our standards have certainly dropped and carrying toilet paper is often a must) we are fine. The virus on our USB with our photos seems to have reared its ugly head again and we fear that our photos from NZ, Santiago, Buenos Aires and Uruguay may have been eaten up by the little worm that has infected our USB but that is something we will deal with upon our return. Today we scored a 32GB USB for the equivalent of AU$25 (probably more than AU$50 back home). We're ahead of schedule by 1 week at the moment and not sure where we'll use it up. Think i've written enough for now. Hope you have enjoyed the latest tale and Marcello's accompanying photos.